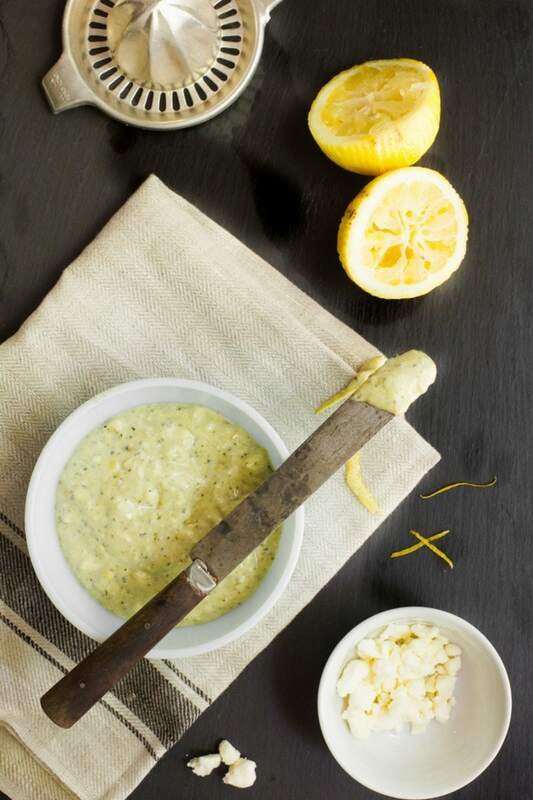 Can’t figure out what to serve your vegetarian guests at your summer cookouts? 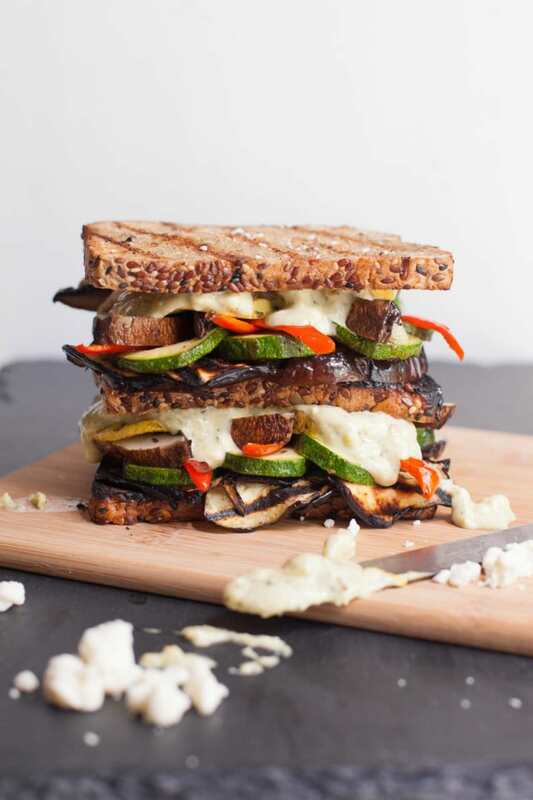 Try this Grilled Veggie Sandwich. Don’t skip the Pesto-Feta Mayo! My total and complete inability to grow zucchini has been well documented on this blog over the past few years. I’ve heard that summer squash are some of the most prolific and easy-to-grow vegetable plants in the world—but I can’t grow a zucchini to save my life. I’d consider myself to have a pretty green thumb (at least chartreuse), but man, zucchini really hate me. Can I grow enough Roma tomatoes in a summer to put up six dozen jars of diced tomatoes? Easy. Is my garden chock full of amazing herbs? You betcha. But zucchini? Forgetaboutit. My husband and I have grown a garden every one of our nine summers together, and we have never been able to get zucchini to grow for us (and it isn’t a climate issue, zucchini grow crazy well for everyone else around here). Until this year. FRIENDS. I HAVE ZUCCHINI. I’m almost scared to write this post because I’m afraid of jinxing it. But as I type this, there is a zucchini plant down in the garden that is producing the most beautiful, full-grown, super tasty zucchini. I’m afraid to touch her for fear of spreading my bad zucchini juju to her leaves. IT’S A SUMMERTIME MIRACLE. When we picked our first zucchini (and we picked our first yellow squash at the same time—something else we haven’t been able to grow), I knew exactly what I wanted to do with these special veggies. 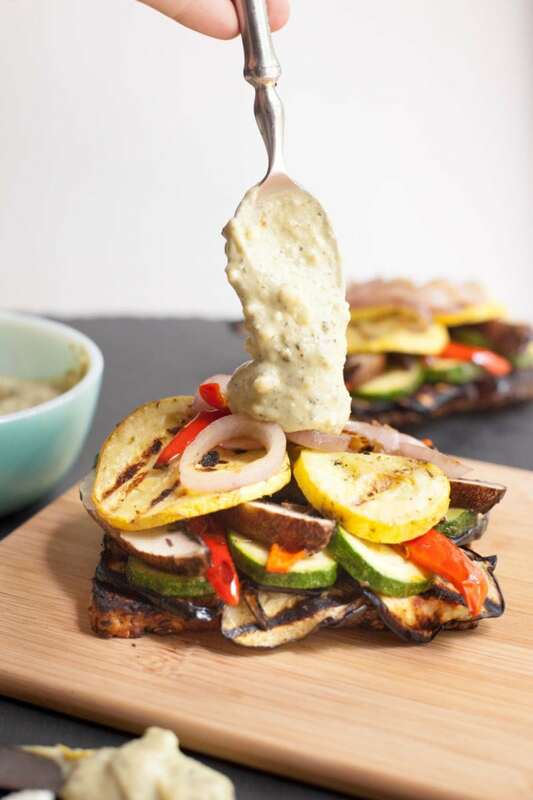 For as long as we’ve been trying to grow zucchini, we’ve also been making a grilled veggie sandwich featuring zukes (does anyone ever call zucchini Danny Zukos? They totally should if they don’t.). We obviously bought our zucchini for these sandwiches before, but I was so excited to make these sandwiches with our zucchini. These grilled veggie sandwiches are a weekly thing for us in the summer. They really are meant to be eaten when veggies are fresh (and cheap). Would this taste good in January? Probably. But it’d also cost you $15 per sandwich to grab all the out-of-season produce. Eat these sandwiches now. Eat them often. And then dream about them all winter long. That’s what we do. A grilled veggie sandwich might seem like kind of a snoozefest, and that’s where this amazing Pesto-Feta Mayo comes in. This stuff is so good, my husband was literally eating it with a spoon while I was photographing this sandwich. It doesn’t overpower the flavor of the veggies—it just adds a nice, rich, tangy flavor and some cool, creamy texture. You can adjust the veggies of this sandwich all you want. Don’t like mushrooms? Leave ’em out. Only have green peppers? Cool. Want to add tomato slices? Sweet. But promise me you won’t skip the mayo. Even if you want to use vegan mayo and tofu or almond feta and vegan pesto, you have to make this mayo. Pinkie swear it. Right now. I’m extending my pinkie finger out, are you? You better be. Of course, this sandwich uses the only bread we eat in our house: Dave’s Killer Bread. 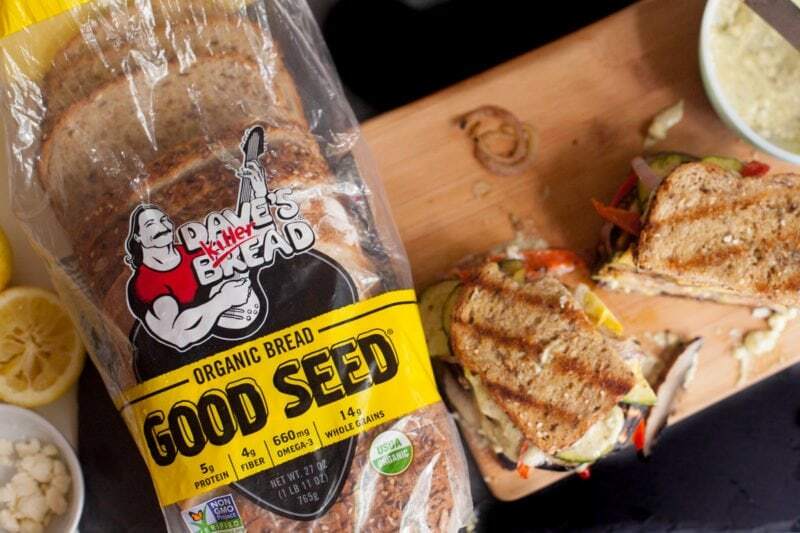 All of the DKB breads are organic, non-GMO verified, and have no artificial anything in them. Dave’s Killer Bread is the kind of bread I’d make at home if I had time to make bread at home (someday, in the future, maybe). This particular grilled veggie sandwich uses Dave’s Killer Bread Good Seed variety—which is my absolute favorite (the hubs and the toddler prefer White Bread Done Right). Good Seed is packed with protein and fiber, and it’s got that awesome nutty, hearty flavor that I love about seedy bread. BUT, it’s soft like a white bread. I don’t know how they make a 100% whole grain bread the soft, fluffy texture of white bread, but they do. It’s sorcery. Awesome, delicious, tasty sorcery. You enjoy this sandwich, and I’m going to go lovingly stare at my zucchini plant (without touching it). 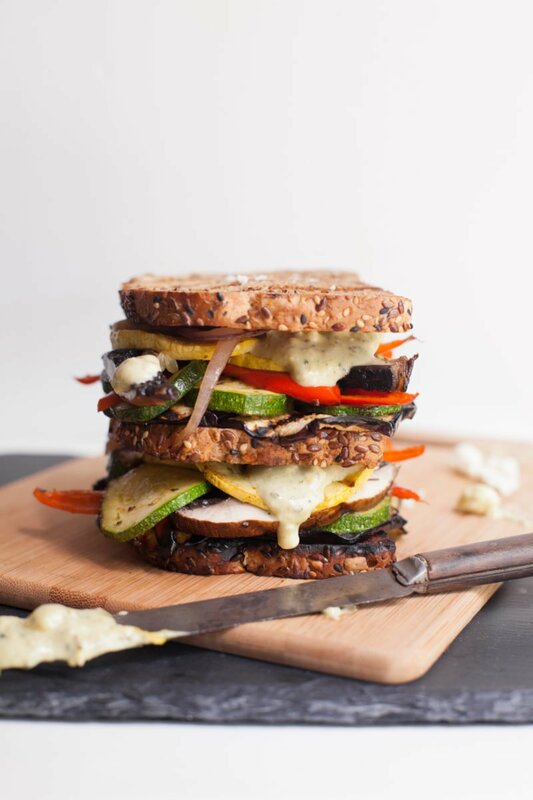 Can’t figure out what to serve your vegetarian guests at your summer cookouts?Try this Grilled Veggie Sandwich. Don’t skip the Pesto-Feta Mayo! 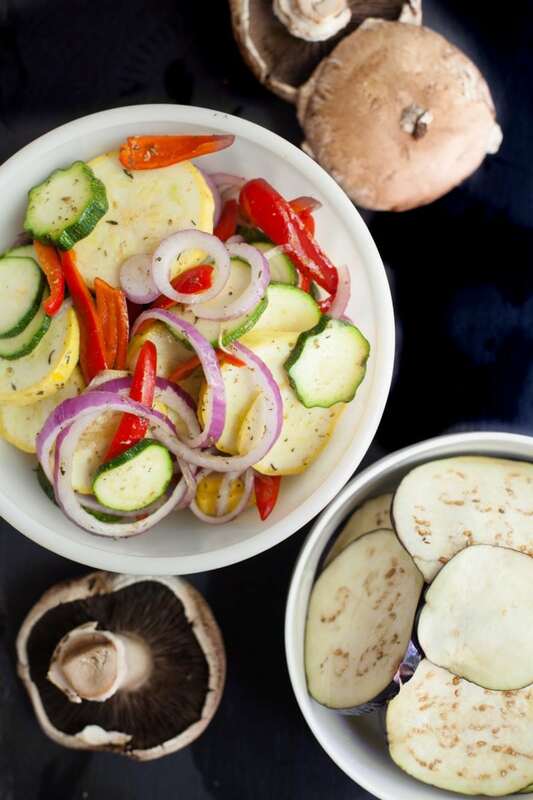 In a large bowl, toss together the eggplant, zucchini, yellow squash, pepper and red onion. Drizzle with 2 tablespoons olive oil and the oregano. Toss to coat. Transfer to a grill basket. This recipe will make four regular sandwiches or two double-decker sandwiches (if you want to unhinge your jaw!). You’ll need a grill basket to do this recipe. If you don’t have one, I highly recommend heading to your local discount store and picking one up. All that seasonal stuff goes on clearance this time of year to make room for back to school stuff. Go get one! 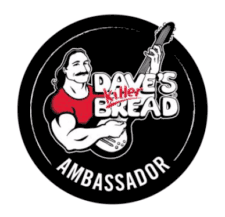 If you want to track down your own loaf of Good Seed (or any of the other Dave’s Killer Bread varieties), you can check out their store locator to find a retailer near you. Enjoy! It’s my first year (actually first 8 weeks) with a space to grow veg and the only thing that’s growing that I had anything to do with is courgettes (which is also the answer to why we don’t have cute names for them!) so I have a feeling something like like to work off is going to come in handy. Although summer squash isn’t something I know, maybe I’ll look into for next year! 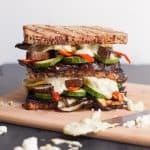 i am not a vegetarian but i love grilled veggie sandwich over meat ones anyday. Looking very delicious and mouth watering..I definitely gonna try this at my home,….thanx for sharing the recipe…..